HDR from 5 exposures. Tone mapped in Photomatix Pro. At the Jacksonville Zoo, this guy was just hanging out and smiling big for the camera. He actually sat still long enough for me to get 7 bracketted exposures as well as several non-bracketted shots. 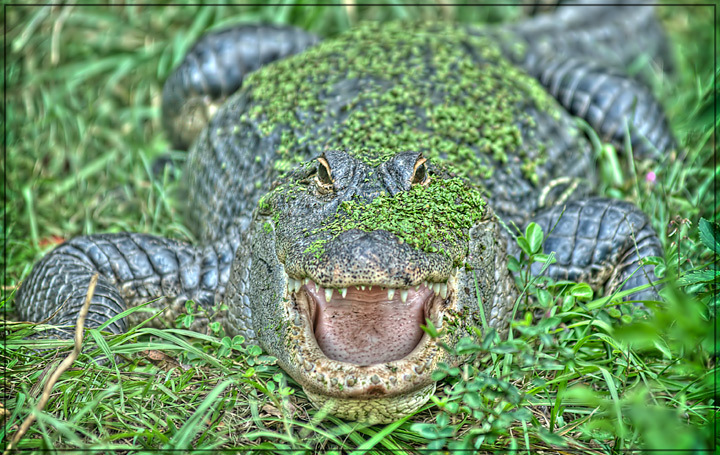 Taken at 200mm focal length through the slats in the fence surrounding the gator enclosure. Moving animals are not easy, nor plausible, subjects for multiple image HDR blending. I'd recommend some different HDR pathways. This is not a natural looking image, although it's a great wildlife capture. Captivating! Seems to need a bit more contrast on the croc, but good detail on the snout and tongue. makes a change from frogs to be sure. Wow - he really blends in. Makes me feel like I am right there. A fun shot, though it seems to have the tonemapping cranked up a little too far for me. Great detail on that tongue, though. I have no desire to see it more closely! That is soooo cool! i'd love to see this with a bit more contrast and a bit darker!!! Scary how nicely he's camoflauged! Proudly hosted by Sargasso Networks. Current Server Time: 04/26/2019 02:38:40 AM EDT.